Increase Your Efficiency – One Checklist At A Time! With pennies hard to come by these days, every step you take to improve your productivity can add dollars to your bottom line. A simple way to increase your efficiency is to use checklists. Checklists ensure that tasks get done the same way every time, in the shortest amount of time possible, and with a minimum of errors. They can help keep different departments on the same page. Checklists can even be used as a training tool for new employees. The benefits of completeness, consistency, and timeliness can be felt immediately. It is easy to fall into the trap of saying, “I’m an expert. I don’t need a list to remind me what to do.” Unfortunately, that’s when you need a checklist most. When a task becomes second nature to us, we can get complacent and forgetful. How many times have you gone to the grocery store without a list and forgotten the most important item you needed? Missing one thing won’t kill you but it takes a lot more time when you have to go back to the store a second time. A checklist should not be viewed as a crutch, but as a useful tool to improve efficiency. To begin using checklists in your business, start with a complex task, or one for which steps are frequently forgotten. Ask those familiar with the task to write down the steps for doing it. Have several people review the list — one familiar with the task and one who is not. The person familiar with the task will help fill in missing steps. The person unfamiliar with the task will help clarify steps. If multiple departments are involved, have each department create their portion of the checklist. Then get everyone in the same room to consolidate into one master list. 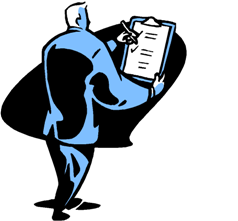 One final note, a checklist should be all-encompassing, whether or not you perform each step every time. It is easier to cross off an unneeded step than to try to remember to add it.